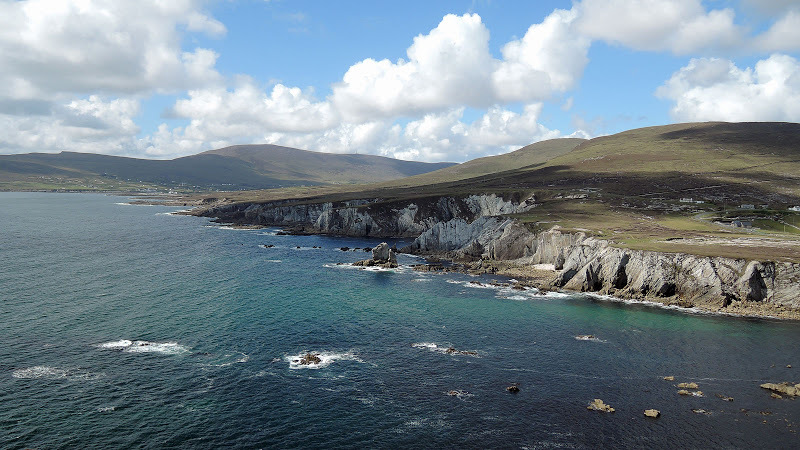 In Summer 2015 new scenic walking trail was officially opened on Achill Island: the ‘Slí Ghráinne Mhaol’ loop walk. 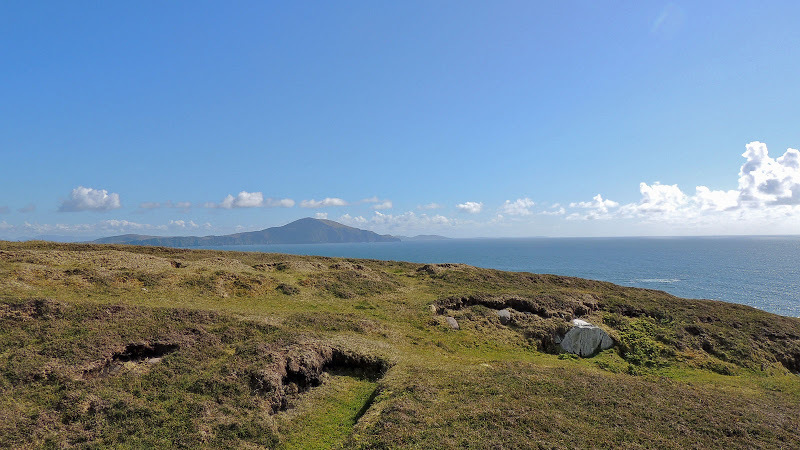 The loop walk bears Ghrainne Mhaol’s name because it offers stunning panoramic views on her sea kingdom: Blacksod, Clare Island, Clew Bay, Croagh Patrick and the mountains of Connemara and her castle at Kildownet is visible all way long too. 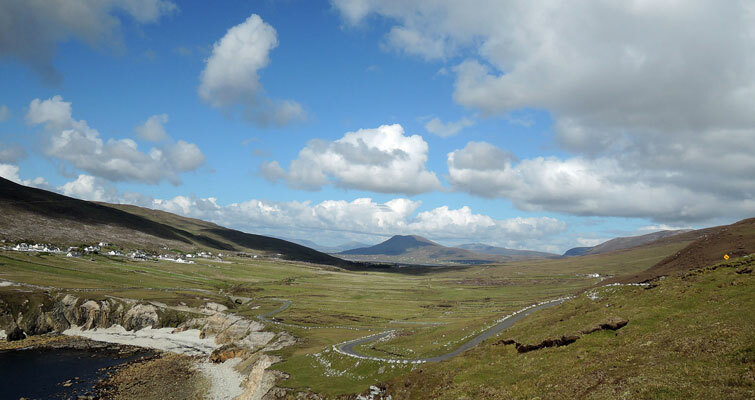 It is a 6.8km loop, running through Derreens, Kildownet and Ashleam on the Wild Atlantic Way At Achill Sound drive toward the west and take the first road on the left. 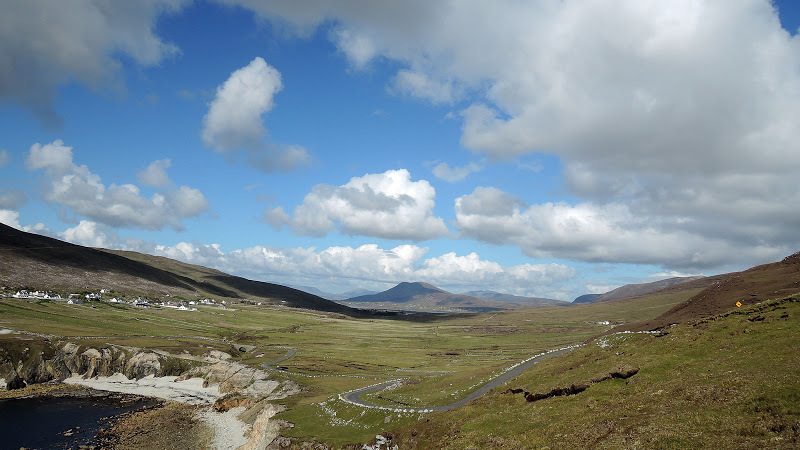 Then keep travelling along the Atlantic Drive. After 4km you will reach Johnny Patten’s Public House in Derreens. Park the car near the pub, the starting and finishing point is just beside it . Follow the finger signposts: green arrow on white background with Granuaile castle logo. It reaches heights of 189 metres and it should take walkers approximately two-and-a-half hours with a total ascent of 334 metres. The walk winds along the bog road built as a project for local men during World War II and the bog road called the Elephant Road through hillsides. It covers some of the ‘Historic Coffin Trail’. 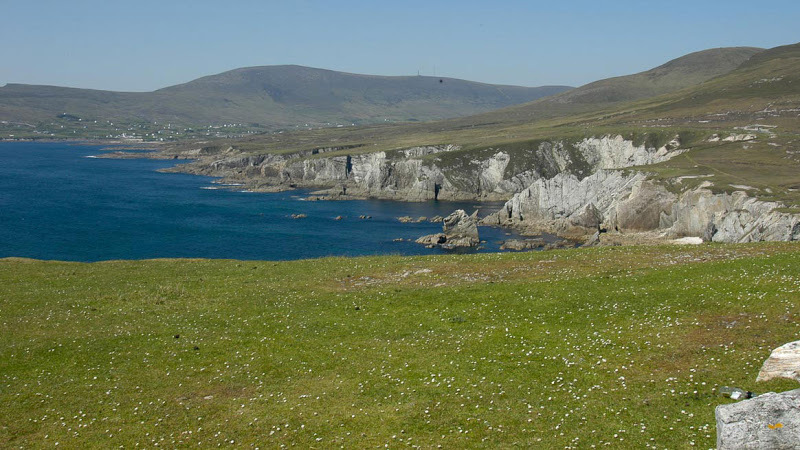 In the past along this route coffins were brought from all over Achill up through the hills to Kildownet graveyard (the only cemetery on the island). Climbing the mountain carrying a coffin was a very strenuous and exhausting task. 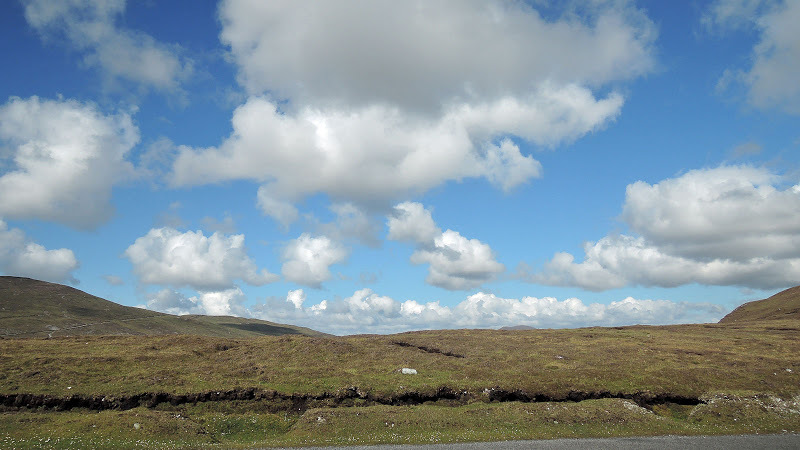 People would rest every so often and when they did they made a pile of stones, called ‘leachtaí’ or little cairns, which marked their resting place before commencing the descent down to cemetery. 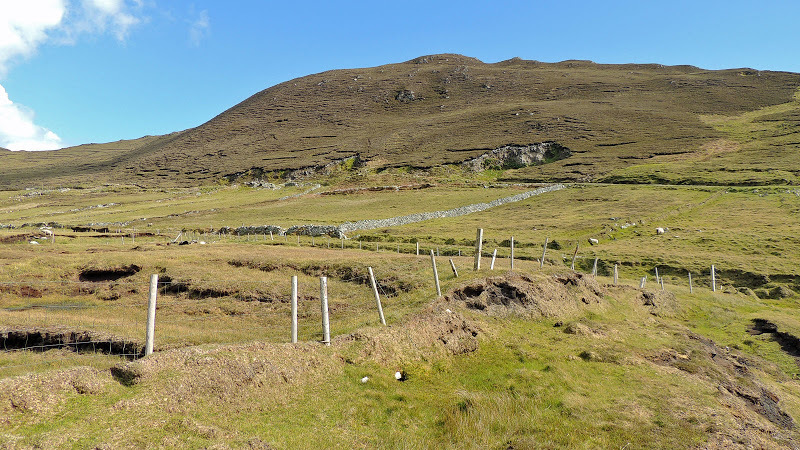 Along the way, deserted villages such as Ailt and old cottages, from where families were evicted by the landlord William Pike in 1854, can be seen. 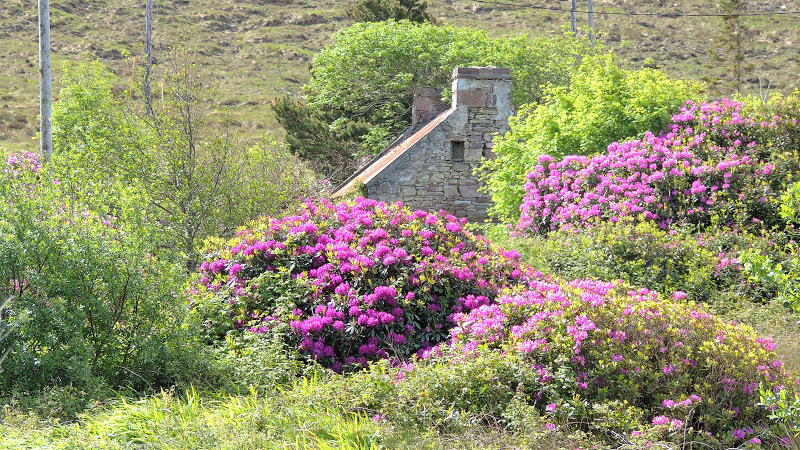 From the final section of the walk Carriage Na Loinge can be spotted. It is a rocky outcrop located between Shraheens Points and Belfarsad. 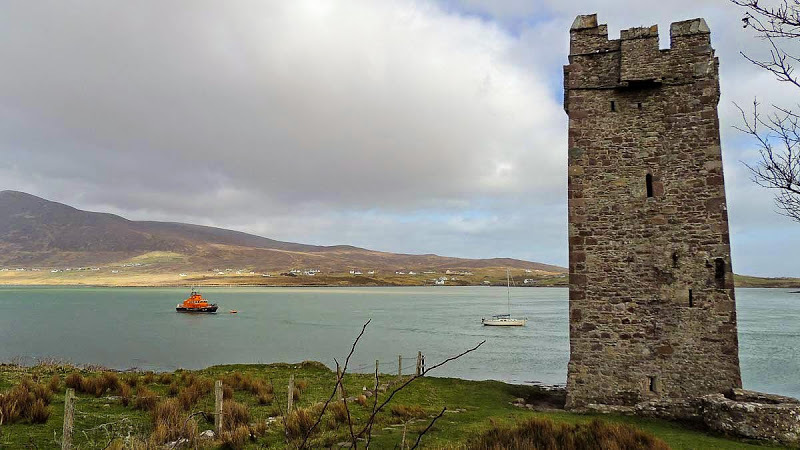 It used to be a landmark for yawls and hookers carrying goods and travelling to and from Westport. Remember to wear walking shoes and bring rain gear, snacks and fluid with you. Underfoot conditions can be wet in parts.